Wanting to start your children off with an early passion for helping things grow? Veggie Pops are a great tool for doing just that! They are easy to manipulate for kids that are still too small to hold and plant a tiny seed, or children whose fine motor skills are not strong. They are also a fun and original activity that kids love to participate in! What is a Veggie Pop? Veggie Pops look like lollipops, but are actually little growing machines. They are made of biodegradable recycled paper pulp that is formed into a hollow ball, a seed is put inside the ball, then a stick is attached. The result is an adorable gardening helper that gets kids interested in growing things. There are two ways to plant a Veggie Pop: you can buy the pops separately and plant them in your own dirt-filled pot or you can buy the Starter kit that comes with a pot and it's own wonder soil. 1. Water your dirt pucks! This part of the process is so fun. 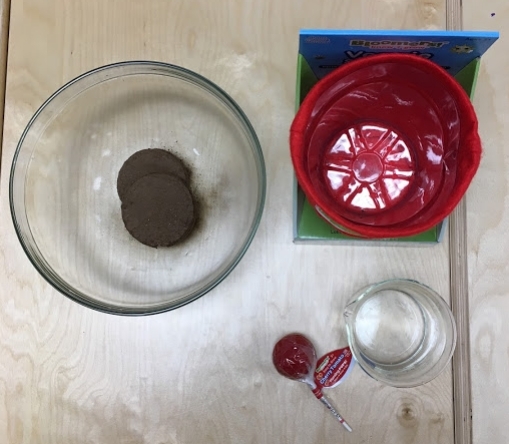 These tiny pucks will turn into a whole pot of dirt after you add water! 2. Stick your veggie pop in the dirt! About 1/4 of the pop should remain about the soil. Pour water directly onto the pop making sure to get it nice and wet. Your pop should burst open in only a couple hours! Place in a sunny window, water every other day, and wait to see some sprouts! Experiment with light and water. Put plants in two different windows and track how quickly they each grow. Does one grow bigger when you give it one cup of water instead of a half a cup? Put plants under different colours of light. Which one do they like best? Plants movement towards light is called "phototropism." When a plant moves toward light, it is called positive tropism. When a plant moves away from light, it is called negative tropism. Put one plant outside and keep one inside. Which fares better? Try watering one plant with orange juice instead of water. What happens? Try out different types of fertilizer on each plant. Which one do the plants like best?